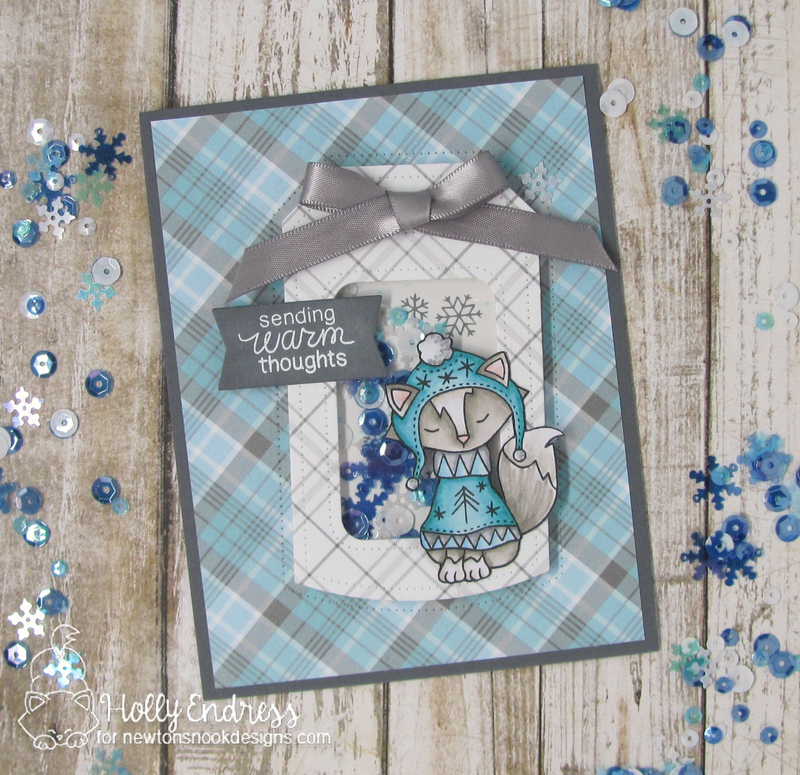 Hollybeary Creations : NND & Studio Katia Blog Hop! NND & Studio Katia Blog Hop! I've created two cards today.... One that's bright and cheery and a Winter card. I'm not a fan of Summer at all (Weather Wise) so I dream of it being cooler outside every day! My first card features the Newton Loves Coffee Set, Clear Round Drops Mix and the Dotted Shaker Tag Die from Studio Katia. I die cut a piece of pattern paper using a stitched rectangle die and then I adhered it to a Turquoise card base. Then I used the rectangle die from the Dotted Shaker Tag Die and die cut a Window in the front of the card. Then I die cut a piece of White card stock with the same rectangle die and stamped the image onto it through the window. This way Newton is on the inside of the card but shows through the Window. I colored the image in with Copic Markers and coordinated the Dots on the cup with those in the paper. I stamped the sentiment onto a Banner and adhered it in the upper Left. Then I added some of the Clear Round Drops on a few of the Dots with some Glossy Accents. For my second card, I used the Dotted Shaker Tag Die to create a shaker on the front of the card. The Dotted Shaker card is unique because it cuts dots in an outline around the tag. I die cut a piece of pattern paper creating the dots around the tag. Then I adhered the panel to a Grey card base. I die cut the Dotted Tag again from a coordinating piece of pattern paper and then again using the rectangle shape in the center to create an opening. I stamped some of the snowflakes from the Newton's Nook Sweater Weather set on a piece of White cardstock and used that as the back of the shaker. I created the shaker and added the Winter Wonderland Fusion Mix from Studio Katia. I adhered the shaker tag in the center of the tag opening on the front of the card. I stamped and colored the fox image from Sweater Weather and colored her in with Copics and then fussy cut the image out and adhered it to the Shaker. I really like this Dotted Shaker Tag Die it's very unique and great for your stash! You can't have a fun blog hop without some prizes, right? You should have arrived here from Kristina's Blog if you get lost along the way there is a complete list on the Newton's Nook and Studio Katia Blogs. Next on the Stop is the Fabulous Laurie. Both cards are so incredible! What a great use of that die set!!! The first card is super cute! But the 2nd is stunning! Love both of your cards, the second just gives me warm feelings! Oh, that second card is just ubersweet! Love it! Both cards are fabulous! I really love how the polka dots on the mug match the polka dot paper. Beautiful cards. I love how the coffee cup matches your pattern paper. What great cards. Love your design ideas and colors. They are both so lovely, Holly! The first one is so fun with the bright polka dots, and your winter card is so cool and pretty! I love all the plaid on it, too! Lovely cards.. the blue and grey one looks so beautiful! Only two main colours.. yet so stunning ! Great cards! Love the dotted one. I have a crush for dots. Great cards and love the Sweater Weather stamp set! These are both adorable! Newton looks so cute peeking over the table at the coffee, just like my kitty! This is such a great hop, with two fantastic companies. Darling cards! Love those polka dots! Fun stamps and dies! Enjoying this collaboration hop with NN and SK! 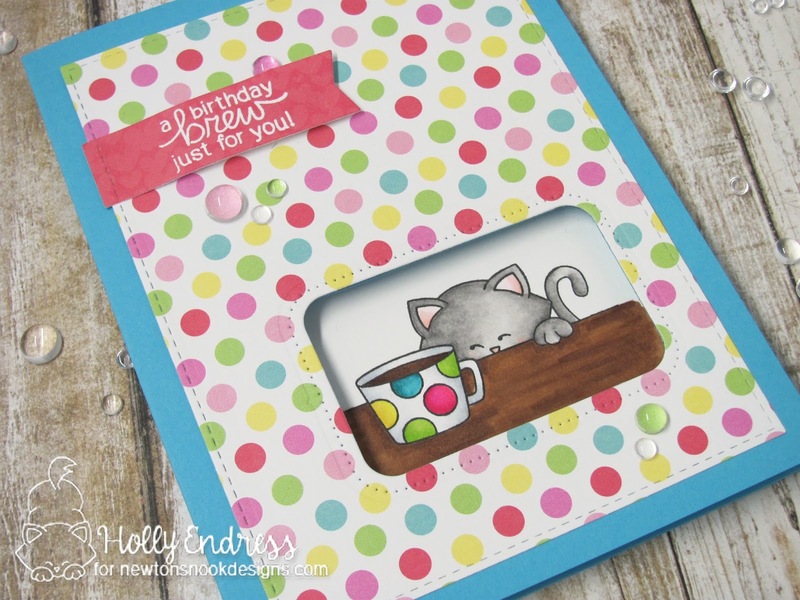 Holly, I love how you showed the versatility of the shaker tag! These cards are awesome!! Love your cards! Wonderful coloring. Love your sweet dotted and plaid cards!! I love the colors you used for your second card. I love how you were able to create the dotted line around the tag. It just adds a little more to the card. Both cards are completely charming, but I especially love the first one. I love the fun colors on that one! Wow, I love how you coordinated the stamp elements with the patterned paper. Very cool. Love that kittie eyeing for the coffee. Too cute! so cute! I like your coloring, choice of papers and the dies. Oh I love your cards! I simply love that second card; I'll have to look into that shaker tag die! Cute cards! I love the polka dot card with Newton looking through! These are both so cute! Fabulous coloring! Both of these cards are so cute! I love the polka dots on the first card and the tag on the winter card is so beautiful! Thanks for hopping along with us! Is it bad that I want a coffee cup just like that?? Love how you used the tag's window for that too! You second card with the tag is super fun...love the prints!